Well, we had a “big quake” that is almost a “great quake” on top of the high tide interval, just not in Northern America. It was a 7.3 quake in Honduras. So the question is, what will next month bring? I’m still holding out for a large quake in the northern hemisphere, probably the Caliveras. Though frankly, given the Long Beach, and now this Honduras quake, the tidal impact on quake triggers is fairly clear. The big question now is how to focus it in on a particular continent, IMHO. A magnitude 4.7 earthquake struck about 3 miles east of Los Angeles International airport at 8:39 p.m. (PDT) local time, at a depth of 8.5 miles. Given that the location is in a densely populated part of the Los Angeles basin, it was widely felt. Initial estimates from the USGS ShakeMap indicate that although strong shaking will have been felt by many people, damage is expected to be light. The initial focal mechanism is consistent with slip on the Newport-Inglewood fault, which was the source of the damaging 1933 Long Beach earthquake. Three of the early aftershocks, however, are west of the Newport-Inglewood fault trend. Later aftershocks are expected to help define the fault plane that ruptured. The Los Angeles basin is crossed from northwest to southeast by the intensively studied Newport-Inglewood fault zone. In 1920, the Inglewood earthquake (M 4.9) occurred in nearly the identical location to this evening’s earthquake. The 1920 event was the original reason for identification of this as an active fault zone capable of damaging earthquakes, which then later proved to be the case in the 1933 Long Beach event. After the 1933 event, the name of the fault zone was changed to the Newport-Inglewood fault zone in recognition that it is continuous from Beverly Hills to Newport Beach. The tide charts do show the next few days as a high stress period (though June 18-24 or so has more stress), so once again, I’d advise folks to top up those water barrels and stock up the emergency food storage if you have not al ready. So where does the angular momentum go in this case? Original image is available, or with a description. I was at the USGS site that week and the pattern of that week was continuing the following week (though a bit further down the fault system). That week the activity was a bit heavier north of Hayward, but the following week we had some more activity a bit further south. Given the historical tendency for the Hayward side of the bay to let go with a big quake some years after the S.F. side (and given the Loma Prieta quake just a few years ago – in geologic time scales, at least) this is looking just a bit spooky. The rest of this posting is in that historical context where “this week” is the week of March 9th. Sun, Barycenter, Sunspots & Quakes? This entry was posted in Earth Sciences and tagged Global Warming, science. Bookmark the permalink. 90 Responses to Are We Quaking? Wouldn’t such a thing affect all faults on the planet? Haven’t noticed anything out of the ordinary here in the Seattle area. I don’t see any validity. The tidal forces are extremely small. The moon has an exponentially greater tidal force than any of the other planets. and you will notice that I do cite the tidal forces (mostly from the moon). The idea that angular momentum changes figure in is more speculative, but with some correlation data behind it (and oblateness / crustal flex would add to tidal forces). BTW, as the earth passes from apogee to perigee we, too, have a spin rate couple to our orbit, it isn’t just tidal forces… I’ve been getting my head wrapped around the spin-orbit coupling physics; it’s not just for sub-atomic particles. And most of what I’m doing in this page is just seeing the activity on the fault that goes near my home (from the USGS map) and knowing that pre-shocks DO happen, taking my normal precautions (it helped a great deal when I came through the 7.1 Loma Prieta with only 1 wine glass broken – fell off the fireplace mantel…). Not all parts of the planet have the same tidal forces. Not all faults have the same history of stress buildup. Those with the most pent up stress (longest time since last release) are the ones with “the trigger set”, peak tides with the moon at perigee are the strongest trigger, but don’t set off all faults at once. Only the ones that are more or less ready anyway. May I have your permission to use this graph in this web page? Is the simulator program fairly clear? I have a Mac and a Linux machine, but generally avoid Micro$oft Windows. FWIW, I don’t really notice 4’s any more unless I’m right on top of them. 5’s are mild fun. A 6 or so is something to notice and enjoy the ride. And my standard of measure is the 7. Now that was a fun ride! But having lived through it, unless you are right on top of it (or your house is not bolted to the foundation); a 7.0 or less is not a problem, it’s an amusement! You can use the graph, no problem. The program is a little involved and unconventional in the way it is set up. But a Linux port is clearly within my options, I have done it already for my 3d simulator. I will make a linux port of Sim2 if you think it is worthwhile. So we’re talking about Moon-Earth tidal effects, not Jupiter/Saturn-Earth tidal effects. I’m talking about 3 effects. 1) Classic earth moon sun tides. Probably the strongest impact on the system. See the Birkeland links above. 3) Fault systems build up energy over time. Then they dump it. Prior to the dump, there are often swarms of microquakes or preshocks. The USGS map looks more active than many I’ve seen in the past and there is a suspect tendency for the activity to be on a fault that is known to be loaded and ready. That is the more worrisome of the three points. The quake map. But it is harder to predict from the map and harder to know what it means since the random nature of quake timing makes a 1 week map limiting. Kind of like looking at 10 minutes in the stock market and trying to predict the year! But if that 10 minutes is up 450 points, you have a clue! Carsten Arnholm, Norway: You can use the graph, no problem. Thanks! I’ve added your site to the blogroll at the side. <The program is a little involved and unconventional in the way it is set up. But a Linux port is clearly within my options, I have done it already for my 3d simulator. Well, I have Linux boxes and a Mac. My only Windows box is a Win95 laptop with a broken screen (I can plug in an external monitor …) and I don’t really want to get another MS Windows box. There are a lot of folks like me. Mac and Linux or Linux only. For the windows version, you have to be using Win2000 or newer, no Win9x. Be sure to install the MS redistributable. I guess I’m not following all this. Are these the effects Geoff Sharp is talking about in various threads on WUWT with Leif Svalgaard? #2 is one of the effects from the change of angular momentum Geoff Sharp et. al. talk about. #3 is classical earthquake theory. Taught in geology classes. #1 is the theory of Birkeland tying the timing of quakes to classical sun/moon tides (though he does add in a lunar perigee metric so he might be picking up some of the angular momentum effects without explicitly saying so.) Please follow the links given and read about his work if you need more information about it. The thing I’m adding to this is the idea that they all can work together. Birkeland has had success in prediction of a broad statistical window. It could be enhanced by explicitly factoring in angular momentum changes (when there is just that little added bit more stress on the fault) and narrowed in space by looking at those faults on the surface of the globe with the energy build up and history to say that they are “ready” – in particular, the one near me! So we take #3, classical earthquake theory, and it says that the Hayward / Calaveras system is just about fully loaded (after a long quiet period building up stress due to plate tectonics) and just about the right time (due to the geologic record of past quakes where the ground shows the San Andreas has a great quake, then a few years to decades later the HC system has a great quake) and we look at the USGS map and see a line of lots of small quakes (like maybe preshocks). That alone is enough to be worried. All classical geology I learned at U.C. in geology classes. But we add in #1, the tides information. It tells us exactly what windows are most likely to trigger a quake (and to fully use the Birkeland method we would need to add a bit more having to do with lunar perigee and maybe earth perigee). Finally, on a broader note, I add in #2 where the spin of the sun and planets is tied to the conservation of angular momentum (google “Spin orbit coupling wiki” and read up on it – it is not just subatomic particles that have spin-orbit coupling.) and note that this will add just a wee bit more stress to the crust of the earth as we turn some of our share of the total angular momentum from “orbit” into “spin” about our axis and point out that we are in for a prolonged period where this effect will be rather larger than usual (though still smaller than the other two effects) and point out that there is a historical record of excess quakes and volcanoes during these intervals of solar system angular momentum changes. (I.e. look at the Dalton and Maunder and you find large volcanoes right in them in greater degree than random). That adds just a bit more concern to the point for the next decade. Taken together, I make the leap that the HC system is worth watching, closely, in the next months and years; and that it would be good to get my quake kit out and check for completeness (and freshen my water storage). I’m following it generally, but I have trouble with the idea that the planets cause any sort of major movement of the sun. It seems that if this were the case then the planetary orbits would be so chaotic that they would spin out of the solar system in short order. The known tidal effects on the sun from the gas giants is on the order of less than a millimeter (according to Svalgaard), so I fail to see how they can do anything really measurable to the sun’s rotation. The sun moves about 2 solar diameters from the effect of the planets! Take a look at the barycenter picture above. It has a “polite fiction” in it in that it shows the sun standing still. In reality, the center of mass of the solar system (barycenter) is better used as the frame of reference. Then you would see the sun wobbling about that point by alot. (Roughly, the sun would be moving about as much as the sprialy line does in the picture above). So when the sun goes from 1 diameter away from the center of rotation (1985 at the top of the barycenter picture) to almost on top of the center of rotation (say 1991) the “spin” on it’s axis changes (and the implication is that this also changes the working of the solar dynamo and fluid flows). Now I happen to remember that 1991-2 was surprisingly cold with abnormal snow here. This is the Geoff thesis (Landschedt et.al.). But wait, there is more… Because angular momentum is bigger when an object moves fast and far away from the center, most of the angular momentum of the solar system is in the gas giant planets (Jupiter, Saturn, Uranus, Neptune) and as they move to apogee / perigee they have lots of angular momentum to conserve SOMEWHERE, and that might be in their spin, or the sun, or even in the spin of the Earth. The gas giants perturb the orbits of the minor planets, so this will cause some shift of orbit / spin. The only question is: Is it enough to really change volcano and earthquake rates? And no body knows. All we have is correlations. Every solar minimum has a lot of quakes and a few very large volcanos. Accident or causal? Endless arguements follow. I would love to see such a spiral plot with total earthquakes plotted on it (size or color of dot proportional to total energy) like the USGS does for quakes (though they do it over dirt while I’d like to see it mapped to the angular momentum picture). That ought to pretty quickly show if there is a strong match. Angular momentum is Position Vector (crossproduct) Mass*velocity. It helps, it really does. And I don’t want you to think I’m baiting you on or anything. I spent my formative years loathing math, and building plastic models of WWII tanks, lol. I guess my question would be, is there any support for Landscheidt’s theory from any other published scientists? I suppose one problem with merely having a correlation is that quakes happen all by themselves, so a correlation could just be noise or coincidence? Per other folks publishing in support of Landscheidt: Yes there are several. Fairbridge, Charvatova , and a couple of others. And don’t worry about the questions. It’s helping me get a better handle on how to explain this mess of interacting complex systems with icky math; and that helps me get a more intuitive grasp of it. See I. Charvatova, Rhodes Fairbridge, Landscheidt, I.R.G. Wilson, and I suspect Singer and Avery though I’ve only read the non-reviewed book not their papers. Blizard (1987) presented evidence that the precessional effects on the sun of the planets depends on the degree of oblateness of the sun and on the angle of inclination of the plane of a planet’s orbit in relation to the sun. Since the sun is a fluid, the precessional effect may induce a fluid flow toward the equator of the sun from both hemispheres. The flow of plasma on the sun directly effects solar activity. Burroughs (2003) reported that the sun’s barycentric motion affects its oblateness, diameter and spin rate. In several papers, Rhodes Fairbridge (for example, Fairbridge 1984, 1997 and Fairbridge and Sanders 1987) describe how the turning power of the planets is strengthened or weakened by resonant effects between the planets, the sun, and the sun’s rotation about it’s axis. He further described how resonance between the orbits of the planets amplified the planets’ variable torque applied to the sun. Oct. 2, 2008: Scientists using NASA’s RHESSI spacecraft have measured the roundness of the sun with unprecedented precision, and they find that it is not a perfect sphere. During years of high solar activity the sun develops a thin “cantaloupe skin” that significantly increases its apparent oblateness. Their results appear the Oct. 2nd edition of Science Express. Which they attribute to magnetic effects but they leave open the mechanism behind those effects, at least in this summary. So we have several papers showing planets influence on solar shape and activity and we have NASA measuring changes in oblateness that correspond with periods of higher activity. Thanks again for all the explanations. I’ll get it some day, hopefully. Registration isn’t required to browse and comment, but registration gives you more options. I also have a higher user level for people who wish to become contributors to the site. Have you looked at LOD measurements and earthquake activity? Ian Wilson has some work on that one. He is currently working on a paper re the solar rotation speed change and spin orbit coupling. He has showed me some of the pre release diagrams and it shows a rotation change that correlates with faster rates and less solar activity. The current Doppler images are suggesting a faster solar rotation also, with conservation in mind that might suggest the rest of the solar system is slowing? From my observations the Sun seems stable with high angular momentum for 10 years (J/S conjunction) followed by low momentum for the next ten years(J/S opposed) Its when that pattern changes and we get an altered path (like the purple loop I highlighted on Carsten’s diagram) that we might get an increase in the solar rotation rate. Something definitely happens because the path change always coincides with a solar slow down. Sorry, but I don’t recognize “LOD”… Lunar Orbit Diameter? Long Oscillation Delay? Lots Of Dizzy? Per what’s fast and what’s not: As the sun sits on top of the barycenter, it’s spin picks up (as it’s orbital mo drops) so some of the solar orbital angular mo just goes into spin momentum of the sun. Each planet as it approaches the sun or recedes has some spin / orbit angular momentum going on as well. Now the part that make my head hurt: SOME of the momentum can be transfered from the planet to the sun or the sun to the planet. And I don’t have a good handle on that. It looks like as the planet gets closer to the barycenter, some angular momentum (it has more further away due to the distance vector) has to go somewhere… so what goes into more spin and what goes into the sun? Of, as the sun approaches the barycenter, what goes into spin and what goes into a planet “out there”? Unfortunately, most of the references I’ve found state something along the lines of “We assume a bunch of things don’t change so the math is not intractable”… “Standard Orbital Assumptions are made for simplification” etc. My GUESS would be that it would act as the earth moon system acts. As the moon recedes, our spin drops (more angular mo in lunar orbit, so less for spin). So as Jupiter, Saturn, et. al. approach perigee the sun gets more spin and as they approach apogee the sun slows down. I don’t know how that relates to “alignments” but I do know that due to something called “orbital resonance” the positions and apogee / perigee tend to synchronize in “stable configurations” for reasons who’s math again makes my head hurt (see the wiki page on orbital resonance…). A simple presumption would be that if the sun is spinning faster, either Jupiter, Saturn, or both ought to be approaching perigee and their angular momentum of orbit is going into sun spin? Or maybe it’s just the alignments move the sun over the barycenter and the sun turns it’s orbital into spin angular mo and that’s enough all by itself. At any rate, despite the protestations of Leif, there is a damn near 100% correlation of my personal experience over a 50+ year interval of “abnormal snows” in low altitude California and times the barycenter is near the surface of the sun or inside it. The closer to the center, the colder. This also seems to be directly related to solar spin rate, that is driven by angular momentum, that is directly related to J, S, N, U alignments. Period. LOD = length of day and is used to determine the rotation speed of earth. Ian Wilson suggests the earth’s rotation speed can be governed by a spin orbit coupling. I was wondering if during times of earth rotation change (which also might line up with PDO, NOA) is there any correlation with seismic activity. Email me if you would like a copy of Ian’s LOD presentation. I think your last paragraph in the previous comment is good, I am not sure if apogee / perigee of the planets is much of an influence, the positions are far more important but perhaps the elliptical effects might be a slight enhancer similar to a king tide. I recently read at http://www.astronomynotes.com/angmom/s2.htm an interesting paragraph that got me thinking about distances between objects. With conservation in mind then surely the reverse would also be true. If the “normal” Sun/Jupiter distance was shortened because of N/U would that increase solar rotation? If my calculations are correct we should be in that position now. you give is quite interesting and logical. It is important to include all the major objects in the system for the total angular momentum to be constant. For the solar system that means at least the Sun plus all the 9 planets (or 8 if you will). Maybe it is fair to assume that the spin angular momentum of each planet is constant. The orbital angular momentum for each planet is clearly variable. And obviously the orbital angular momentum of the sun is variable too. If you add all these together you get the total orbital angular momentum from sun and planets, let us call it TOAM (Total Orbital Angular Momentum). It is required that TAM is constant. If you can show that TOAM is not constant over time, it seems to imply that SSAM has to be variable, as there does not seem to be other contributing factors. Or what? That is a good way at looking at the conservation. Wiki has another paragraph that seems to support. If this can work in reverse I think we have our causation. Surely someone has thought of this before. I have emailed Ian to get his opinion. If it is proved, it will tie in with Carl’s and your graph. I speculate if so, that the Sun is used to the push/pull of J/S (J being the Big player). Every 20 years going thru an acceleration/deceleration phase. Its a background engine, if it lines up with solar cycles like it has for the last 50 years it works even better. If one of the acceleration/deceleration phase’s is suddenly brought to a halt midstream we have grand minimum. This sudden halt is caused by N/U? Now to stay on topic as we know how important that is, lets imagine the rotation of the Sun and the Earth are linked, if so, the earth experiences constant acceleration and deceleration which probably goes to the core with all sorts of possible ramifications. If suddenly the rate of rotation ebbs to zero being neither positive or negative does this make conditions for seismic activity more favorable? Ian Wilson’s LOD presentation shows this positive/negative situation. where PSAM is small for purposes of calculation and POAM is very large due to distance vector, while SSAM is large due to large solar mass and SOAM is sometimes large due to large solar mass and sometimes goes to near zero when the solar orbit vector drops to near zero (i.e. when barycenter approaches center of the sun). Now the tricky bit, IMHO, is that as the center of the sun approaches the barycenter, it’s SOAM drops to zero. (Zero orbital vector distance make zero result.) There has just GOT to be some kind of funky going on with SSAM when SOAM hits near zero! What I don’t know: Is it just that J+S+U+N (ooh! Jason…) causes the SOAM to go to near zero by balancing mass around the sun, or is there a component due to the POAM getting into the act from apogee / perigee of the gas giants? That is where knowing their present apogee / perigee would give clue. (i.e. is there any orbital resonance thing going on that has a/p double up on top of SOAM near zero, or is it unrelated and it’s just planet position). Oh, and yes, I’d like the LOD paper! I’ll get it from the link you posted. One final note: While a lot of the articles I’ve seen in places like wiki talk about the tidal force transferring the momentum, I’ve done a thought experiment rather like the “divide into pieces” example above that leads me to believe it isn’t just tides. Still working on how to explain it though. Drew a graph with a ‘center of orbit’ point. Put a hypothetical ‘planet’ center at distance of 10 units with planet radius of 1 unit and planet spin of 1 per orbit (same face always facing the center of orbit). Now displace the planet into a distance of 1 unit orbit. Closest edge is at the orbit center, so no orbital velocity. Yet it had a speed before, and that speed had it making an orbit in 9/10 the distance of the planet center so 9/10 the speed. Now it’s zero of orbit so speed has to go into spin torque (conservation of MV). Seems to me it would still have that speed, but that speed would now have to show up as spin. And no tidal forces involved. So Liefs complaint about free fall and gravity does not apply. Now imagine said ball is a big fire ball of fluid plasma… I have to think that such a force difference would disrupt whatever ‘conveyor belt’ was working … and kill the sun spot cycle. But it’s the showing / proving it that would be hard. It’s the spin orbit couple that drives the whole thing, both solar output and ocean phase, amplified by GCR / ozone modulation. WOW, a 7.9 in Tonga! I’ll say we’re quaking! Seems us “barycenter” guys are gaining momentum. To me its not about being in one camp, but more about continually asking questions until we understand the mechanism. I think we might be very close to some amazing new discoveries. Current science is struggling, time for a different approach? Part of the problem, I think, is that folks like Leif are looking for a tide effect. If my “thought experiment” is correct, it isn’t about tides at all; it’s about conservation of MV. I still don’t know how spin-orbit coupling works, but clearly it does. It is central to several aspects of subatomic physics. What would make the physics change with scale? I am still working on this earth/moon system and the conservation of angular momentum, not sure if there is something in it, but I need to be sure. It might have an answer to your question. Ian Wilson says its plausible but perhaps the numbers wont add to much. But to be plausible we must establish if the distance between the Sun & Jupiter can vary more than the normal elliptical factors. I have read many different views on Jupiter’s orbit, does Jupiter orbit the Sun/Jupiter barycenter or the solar system barycenter? How do we find out, can the JPL data tell us, is it accurate when plotting the exact position of the Sun? All of my research is pointing to a solar acceleration/deceleration trend, its just a matter of finding the driver. One big question that boosts the theory: Why does the Sun generally have a big solar cycle when it is experiencing zero angular momentum?…maximum deceleration is my pick. It will be interesting to see the Doppler images on differential rotation in the coming 2 or 3 years. I would expect to see the equator in some sort of stall mode. Geoff Sharp I am still working on this earth/moon system and the conservation of angular momentum, not sure if there is something in it, but I need to be sure. One of the ‘interesting bits’ about the earth moon system is that the moon never goes retrograde… The more accurate description of the system is as a binary planet system where we both orbit the sun, but the moon sometimes speeds up a little bit and pulls ahead, cuts across and slows just a teensy bit as the earth passes it then drops behind and cuts back across again to pass yet again. Ian Wilson says its plausible but perhaps the numbers wont add to much. The numbers don’t need to add much. Somewhere I’ve got a peer reviewed paper written by a ‘traditional’ solar scientist saying that they modeled a solar dynamo that gave our cyclical behaviour as long as the traditional solar dynamo model has a small perturbing force applied… Basically, a little sand in the engine and it bucks a bit with oscillations! But to be plausible we must establish if the distance between the Sun & Jupiter can vary more than the normal elliptical factors. Why? All I see it takes is that the sun follow the movement it follows. Jupiter can follow it’s normal movement, but the SUM of all the planets (especially the gas giants) can stir the sun in odd ways that are ‘more than normal’. L = p x r where for planets there’s very little that changes. A nearly circular orbit has a near constant orbital vector (radians per unit time and distance from center of orbit both nearly constant, though for a planet like Uranus, the distance part of that vector is a very large absolute number! Lots of momentum to play with!). The linear momentum part is also nearly constant (planet mass x velocity). Where it gets very interesting is the sun. For the sun, that position vector has 2 terms that can both go to near zero (and maybe actual zero!). First is the distance from the center of the orbit (which is defined as the solar system barycenter). Clearly that can vary from about 2 x solar radius down to at least 1/10 x solar radius in 1990 by inspection of the above graph. That’s at least a 40:1 ratio. The second is radians / time unit of orbit. Look at 2003 to 2007, there is about 1 orbit of the barycenter and it’s not changing where the sun is by very much! Radians / time is ‘way low’. In the 1990 pass, you go retrograde for a bit, I think; that means that by definition, your orbital vector went from positive to negative and back. At some point it had to pass through zero. Not your typical planet! My belief is that during those ‘quick trips’ of a “leaf” in the center we get one or two cold years. But to really cool things off takes a decade or two of not much happening (i.e. 2003 to 2017) and that lets the sun drop to ‘way low’ output due to the persistence of the lack of change of angular momentum. It has time to stabilize at smooth flow and no disruption surfacing spots. The thing that complicates your life is that 2 things can make L = r x p drop to near zero: Both the position of center of mass near center of orbit (1990-91) AND the linear momentum going low (few radians / time) 2003-20017. Either side of 1990 we had large change of position of the center of rotation (large delta radians / time so large delta angular momentum – so lots of induced flow possible). Times like 1999 the center of rotation is far from the center of the sun (position vector long) so you get lots of momentum to stir things and your radians / time becomes large. Not much chance to stablize. But times like now, the barycenter is inside (or nearly so) the sun and there is little change of it. The sun can stabilize at smooth flow with little turbulence. And since it can take centuries for energy to get to the surface, with no turbulence induced just a little less gets out. I have read many different views on Jupiter’s orbit, does Jupiter orbit the Sun/Jupiter barycenter or the solar system barycenter? This is Anna’s hang up. Since it’s both, it can not be real and can have no effect. Now I’m going to leap off a cliff here and make a completely unfounded bald assertion: I think you will find that for some things (like sun / Jupiter relative positions) you can use the sun / Jupiter barycenter as your frame of reference and it works OK so we do it (but there is a bit of error since we are ignoring other planets…) But to really know what’s going on, you must solve for all bodies in the system. Since Mercury, Mars, Earth, Venus are too close to the sun and too small to dominate (though WE might get shaken by the sun and jsun causing quakes!) and Pluto is too small to matter much. Don’t know what the Oort cloud does! I think I’ve addressed this above. I think what we will find is that it is extraordinarily stable. My guess is that it’s the bumps in the road that stir the spots to the top that gives the extra energy. When everything is steady, we get a flat minimal output. Like stirring hot oatmeal, you get more steam when you stir it! We have two different thought experiments going on here I think, you are talking about the actual path the Sun takes, an inner retrograde loop and an outer more gradual loop. From my understanding the conservation can be maintained by more than one method. This is seen in a typical elliptical orbit where the orbit speed adjusts to suit the different distance between the 2 objects. I think this is what Svalgaard is getting to in his latest answer to you on WUWT. The orbit speed changes not the rotation speed. If we look at the ground covered by the Sun in the outer and inner orbits they vary greatly, but the time interval is very similar so momentum has been conserved by the change in the orbit speed. In my experiment I have a real world example of the Earth/Moon System where a rotation change in Earth changes the distance between the Earth and the Moon. IF the Sun/Jupiter distance varies during the different paths taken on the 2 loops (outside of the normal elliptical stuff) then we could expect a change in solar rotation. Finding this data might be the hard part. JSUN control 99% of the solar system angular momentum with J being around 50%, the other 3 modulate that power and at certain times through their alignments can reduce the angular momentum back to near zero. Oh, I think I see what you mean by “normal elliptical stuff”! I had originally taken this to mean ‘not in accord with Kepler’ and sort of slighted it… When what I think you are actually saying is “Jupiter follows a Kepler orbit, but the Sun has a little displacement that reflects the delta spin”. Yes, I think you are on to something. Yes…gotto love those assumptions, sort of like the science is settled. If I can prove the orbit of Jupiter is about the SSB the figures can be worked out, we have a template in the Earth/Moon system. My quick back of envelope calc suggests it may not be small. I have been digging like mad and came up with some work from Freeman and Hasling who very clearly state Jupiter orbits the SSB. I contacted Hasling (Freeman unfortunately passed away 2004) and she passed on some of their papers. I think you may find them interesting. Some of it is repetitious, but interesting. I need to prove the Jupiter orbit, so my next step is to try this via JPL which might be a challenge, but I have found a few instruction guides to assist. Basically, the software starts out by computing the position and velocity vectors of the Sun and all the planets using orbital element data. From that point on, updated positions & velocities are computed from Newtons law of gravity only. I assume PSAM (Planetary Spin Angular Momentum) is small enough to be neglible, or at least constant. Since TAM must be constant, it means SSAM (Solar Spin Angular Momentum) must compensate the variation in SOAM + POAM exactly. The first graph shows that SOAM + POAM appears to vary by approximately ±0.1% . I say “appears” because it could be this is all wrong and that I am seeing just numerical inaccuracies, so beware. The second graph shows OAM for the sun and the four major planets individually. It seems clear that Jupiter is the dominant component, with Saturn as number two. So, the question becomes: is the ±0.1% real? Do we have something to compare with? Fantastic work, very encouraging. I understand its a first pass, but the 1st graph is astonishing if accurate. There is a solid hint there has been a trade off in angular momentum. The numbers involved are also very spooky, 0.1% is the also the TSI variance between max & min. Very interesting how the curve looks at 1970 and now, when you compare it with Carl’s graph its the same but in reverse. This could be the key to pandora’s box, but I suspect there is lots more work cross checking etc. The road I have been going down may provide the reason for the conservation. Whats your knowledge on the orbit point of Jupiter Carsten? I can see acceleration/deceleration happening. What do you think E.M…could be exciting? My goal was to try and determine whether there was any residual variation, and I guess my result does not exclude it. But as mentioned this result could also be due to numerical issues. I would actually prefer to see it done independently before I believe it. If Carl’s graph can do this it would be perfect. Regarding the orbit point of Jupiter, my understanding is that this is not always an either/or. I used to believe that the Earth and all planets orbited the Barycenter, even though Leif asserted it orbits the Sun. After doing the work on the gravitator software, I began to realize he was right in a way. But: The main point as I understand it is that an object orbiting in the solar system is generally only dependent on other objects inside its own orbit. So for an object like Earth, there is only Venus and Mercury to worry about, in addition to the Sun. The Sun with its large mass dominates completely, and therefore the “most correct” answer is that the Earth orbits the Sun (perhaps the center of mass when taking only the Sun, Mercury and Venus into account). Similarly, Jupiter only depends on The Sun, Mercury, Venus, Earth and Mars. The result is that Jupiter orbits the Sun “for all practical purposes”. It gets gradually different as you move outwards. An object like Pluto will depend on all the other planets inside its own orbit, and therefore the focus of Plutos orbit will be the Solar system barycenter. My conclusion from the thread on WUWT is that the proper way to compute the angular momentum is via the n-body approach of doing all the individual vectors. That this is not solvable for n>3 is both disturbing and encouraging. Disturbing in that it means we may not get an answer, encouraging in that it means the door is open to more ‘exotic’ solutions than allowed for by the simplifying assumptions used in traditional astromechanics. My unfounded belief is that the use of the solar system barycenter as a proxy for the individual body vectors is a reasonable approximation for the largest body (sun) and probably has small error for Jupiter; with every other body having ever greater error as compared with a sum of the individual vectors solution (due to the inverse square drop off of gravitation causing ever more variance between the impact of all the actual distributed masses actual gravitation and what it would be if all the mass were actually at the barycenter). In other words: A geosync satellite has much more earth gravity acting on it due to being very very close to earth than would be the case if one assumed the earth mass was at the center of mass of the solar system – the SSB – where inverse square would make the graviation much different. It does not induce much error to the calculation of that satellite motion to assume the sun is at SSB vs it’s actual position. For the Sun and to a lesser extent, Jupiter, since they account for most of the mass and gravitation anyway, the error is likely small from assuming it is all at the SSB rather than in 2 different locations (at least for their relative motions). 1) Use the SSB and accept the least squares errors from assuming the other planets masses are at the SSB when they are not. 2) Use the Sun and accept the error that comes from assuming the sun does not move (the other planets have no effect). 3) Try to solve the unsolvable n-body problem. 4) Use the “standard assumptions” and accept their induced errors. All of this unfortunately leads me to thinking that maybe it is not an answer we can compute and that all we can really do at the end of the day is look for correlations and say “See: It Is!” which will not be sufficient for the likes of Leif and Anna (and other ‘mainstream’ physicists) as evidenced by the Ian Wilson paper. Sigh. Here is a direct link to Carl’s graph, I think if it is mirrored and the turned upside down it will match your graph very closely. Dont give up E.M…. I noticed Svalgaard did not answer my question about the Jupiter orbit point. I will see what JPL has to offer. I’m trying my best to be an ‘honest broker’ with Leif and Anna, and giving them every opportunity to say “That bit, that’s where you went wrong”, but they keep giving me their own versions of ‘thought experiments’ and ‘simplified assumption models’ to play with… Not exactly satisfying. Even offering my own examples of what might be wrong has left slippery answers. Does the sun orbit the barycenter or do we use n-body vectors? Is not angular momentum L= p crossproduct r (to establish common base). I’m still of the opinion that observed data trumps everything else, so the observations of folks like Ian Wilson say “This IS happening” and we need to figure out the how and the why; not just dismiss it as “impossible” or “nonsense” or “astrology” or any of the other putdown deflections. Frankly, from what I’ve seen of the n-body calculations problem (and I have much more to dig up!) there are at least 6 equations for each object. That much hideous complexity has plenty of opportunity for odd bits of energy to be distributed in unexpected ways. There is more than enough opportunity for the sun to have some energy or momentum to be shunted off to a planet, or for the planets to exchange same, sufficient to slightly stir the solar dynamo or the ocean currents. It’s finding the place where it happens that’s the hard bit. as an example of the complexity. I think E.M’s last statement “It’s finding the place where it happens that’s the hard bit.” is looking correct. I have checked out the JPL horizons System , first of all checking the distance between SSB and the Sun retrieved figures ranging from .0004 -.0097 AU which is about 1.3 million kilometers, this sounds about right. My timescales are from 1950 to now in 1 yr increments. 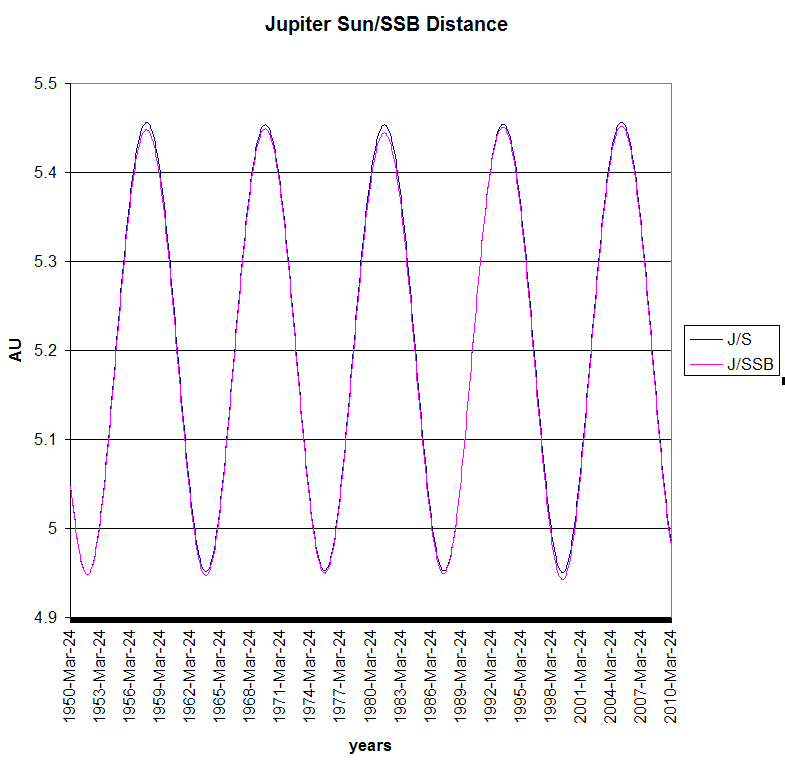 Then I checked data for the Jupiter/Sun distance and it displays the 5.45 – 4.95 AU as per wiki Aphelion/Perihelion and did the same test for the Jupiter/SSB and retrieved figures ever so slightly different. The devil is in the detail, 0.009 AU is such a tiny proportion of the Jupiter/Sun distance but on its own is equal to 1.3 million k’s. What I need to do now is plot these two figures together and scale it so small differences are easily seen and see if there is a trend in the differences. Thanks for the link. I’ve been working (uff! grunt! whuff! whew!) my way through it. Figure 6 caught my eye, too. I don’t know how I’m going to keep up with all the reading with fishing season starting to ramp up. I ran out this evening and caught an even half-dozen black crappie – all 200 to 250mm – in about 45 minutes. There’s a pond about 3 minutes up the road that’s the first fishable body to warm up in my neck of the woods. We have a dock one mile as the crow flies on an Army Corps reservoir, but it will be May before I launch the boat. Then it’ll be September before I’ll again have 3-4 hours each evening to read. There is a difference and its close to the same difference in SSB/Sun distance. Somehow we need to remove the normal Aphelion/Perihelion change from the J/S distance. That will show the varying distance caused by the Sun/SSB distance change. Then we can calculate the solar rotation change based on the distance change using the known Earth/Moon scales. FWIW, this is a document that seems relatively readable, somewhat authoritative, and covers spin-orbit coupling in planets including formulas with both spin momentum and orbital momentum terms. The conclusion I get from it is that a spin orbit coupling does happen, but shows up as precession of the apsides and spin axis and is dependent on oblateness to happen. So this looks to me like there is at least a reasonable set of things that could be a mechanism. Certainly enough to justify investigation. Oblateness changes with activity and has a magnetic component. Oblateness allows other masses to create a spin-orbit coupling to at least that part of the sun. That couple would result in a slow precession of at least the oblate portion. H.R. I don’t know how I’m going to keep up with all the reading with fishing season starting to ramp up. I ran out this evening and caught an even half-dozen black crappie – all 200 to 250mm – in about 45 minutes. does some interesting thought experiments to extend gyroscope physics math into the context of a General Relativity world and finds that there ought to be spin-orbit and spin-spin interactions on a macro scale (i.e. not sub atomic particles, 10 cm gyros) that would violate the equivalence principle (that Anna like to keep bringing up with her gyro and skater example). At the end of the paper are some tantalizing hints of experiments that may have demonstrated this effect (though very small and with some failure to confirms). Given that the sun is a very large gyro that does impact on light in a GR way and has some frame dragging going on, maybe there is some relativity that needs to be factored in? The math formulas in the page make my eyes dry out from staring; but the sun and jupiter are both very massive objects in free-fall. I have no idea if they would be considered “near” each other. I know this work is important. I still get word-blind to it. But I do understand the Conservation of Angular Momentum as per twirling ice skater twirling faster as she reins in to centre. Keep it up folks with the beautiful pictures and simple explanations. I like the JSUN which sounds like Jason as in Jason and the Argonauts who were hunting out the Golden Fleece which was hanging in a Hyperborean tree. Strange to tell, that means “back of the north wind” ie polar, hints of aurora, warm arctic, and shifting jetstreams… all weather phenomena linked to the sun relative to the SS barycentre as I’m now discovering. Now the ancients knew a lot more science than is generally credited; they kept their science alive, and running true, by embedding it in their legends… if anyone here reads “Hamlet’s Mill” you will know what I mean. It just seems to me “obvious” that by Conservation of Angular Momentum, as the Sun dances around the barycentre, it’s got to spin faster if it gets closer… but it also has got to spin more smoothly about itself… oh, and puff itself out a little too, ease off its intensity, as a result of the faster spin? Or did I get it wrong? What you described of solar motion is the ‘mental model’ that I see as well. The sun center approaches the barycenter, orbital angular momentum gets conserved (some as Planet orbital angular momentum, some as solar spin angular momentum, and some as planet spin angular momentum, thus the driver for Ian Wilson’s map of earth spin changing with the earth ocean currents). As the sun settles into a ‘less perturbed’ state (like now in that long smooth orbit of the barycenter mosly just at / near the surface) nothing is ‘stirring the pot’ so there is less heat let out at the surface. Basically, when the sun has an irregular skin with some oblateness, the major planets via known physics can get a hold of it and slide it around a bit while inducing various kinds of twisting motion in it. That sure sounds to me like it might let out a bit more energy! It is a storehouse of inspiration. Amlethes and Amlodhi, the precursors of Hamlet described in this book, are very telling; they are much rougher characters than Shakespeare’s Renaissance prince, but they are also archetypal representatives of celestial events. E.M.: You are welcome, I am happy to be exploring these ideas although so much is being discussed that I really have a hard time keeping up. As mentioned, the version on the web does not have the AM feature in it yet. So if you want to try it I need to do more work to release it. The “band I have” is more like ±0.1%. Small enough to be a numerical issue only, big enough to possibly be real. My integration method is quite crude (simple Euler) as I have not been successful with the more accurate Runge Kutta. So my simulations could be accumulating numerical issues of some significance. Don’t ignore that option. As Leif says, calculating the angular momentum is not an N-body problem. It is a fairly straightforward summing of vector products for all objects. The difficult bit is finding the position and velocities for the N bodies in each time step. That is where numerical integration is used and where integration methods and time step lengths can introduce problems. You are right that for N>3, numerical integration is the only way. I am a structural engineer, and in the past often did calculations of moments (like in ‘bending moments’). They could be calculated with any selected reference, but it was always a good idea to not choose reference points that had no moment arm. Maybe this whole problem of “where does the angular momentum go” is just a variation over the same theme. But if we show, as I have tried, that the orbital angular momentum is not constant, we still have a case. I don’t understand your “My unfounded belief… ” paragraph. All body vectors must use the same reference, and I see no problem with that. In any gravity simulator (my own included), all objects influence all other objects all the time. There are no assumptions about “who orbits who”, because the masses and relative distances sorts the whle thing out automatically. The N-body problem is not “unsolvable”, it is easily solved through numerical integration. The problem with N-body systems is that closed algebraic solutions don’t exist for N>3. Trying to adapt N-body problems to algebraic methods will not work, it has been proven. As Leif says, calculating the angular momentum is not an N-body problem. It is a fairly straightforward summing of vector products for all objects. I guess maybe I’m using the phrase ‘n-body problem’ too loosely… I was using it to mean “must solve for all N set of vectors” which sure sounds like “summing of vector products of all objects”… Or is the distinction that “n-body” is reserved for the set of all 6 integrations of all orbital elements for the N bodies where AM just takes the AM vectors (not the other 5 per object in simultaneous solution)? I believe the solar system angular momentum is a physical property independent of the chosen origin. You should be able to chose whatever origin you like and arrive at the same angular momentum value. The torque required to stop the rotation of the solar system is not dependent of the observers point of reference. Selecting the barycenter just makes the calculation easier. Yes. That is a correct statement. Where the barycentrists differ from the traditionalists is that we are willing to entertain that the AM can end up moving between orbit and spin. As noted above, General Relativity allows for this as does the impact of Newtonian physics on oblateness (showing up as precession). There is a smaller argument over “size” of these effects and are they enough or is there an amplifier. But if we show, as I have tried, that the orbital angular momentum is not constant, we still have a case. If it can be shown that the orbital angular momentum is not constant, we clearly have evidence that it went into spin. There is not much else to choose from! I use the phrase “My unfounded belief” when I have lost the backpointer to a reference. I don’t know where it came from, but it is in my brain as probably true (but I can’t point to a foundation source). Hmmm… Very interesting point. N-body is ‘unsolvable’ only in the sense that a formula doesn’t exist. Iteration of many formulas can work. I ought to have realized that! So the n-body problem is the problem of calculating the velocities and positions of N bodies under mutual gravitational influence. It is unrelated to the AM calculation per se. Calculating the AM for an object means computing the cross product of the position vector from the point of reference to the object with the velocity vector, scaled by the mass. The result is the angular momentum vector, which is oriented normal to the orbital plane. Then do this for all objects and compute sum to get AM for the whole system. Hmmm.. when describing this I realised I have made a small error in my AM calculations. I have summed the scalar AM values (vector lengths), instead of computing the vector sum. Since the orbital planes are not 100% parallel, that will introduce a small discrepancy… So I have to fix that issue and recompute. We shall see what happens to the ±0.1%. Hmmm… Very interesting point. N-body is ‘unsolvable’ only in the sense that a formula doesn’t exist. c) Given a time step value, let the computed gravity force act on each object for the length of the selected time step. So, this iterative approach will solve any system with any number of objects. But it requires some computer power and it is subject to numerical issues if for example too long time steps are chosen and/or if c) is not formulated properly. As we are iterating thousands of times, errors can and will add up. So it is necessary to be sceptical to the results. What Lucy is talking about “conservation of angular momentum” is what we are looking for. A trade off that might impart more or less rotational spin on the Sun. I suspect the changes in the Sun’s orbit about the barycenter with only produce a plus or minus velocity on the Sun (which may have its consequences). I have spent all day laboring over JPL figures and might have come up with something that might explain the gap in Carsten’s latest graph. I am trying to establish which point Jupiter orbits, the answer is critical. If Jupiter orbits the SSB, when the Sun moves it will change the distance to Jupiter. If the orbit is around the Sun nothing should change. A change of distance should change the rotation rate of the Sun. I have all the JPL data, Jupiter to SSB distances and Jupiter to Sun distances. The data looks to show Jupiter orbiting the SSB, but I need some confirmation, this stuff hurts your head. I chose a point at 1951 where both the J/S & J/SSB were almost the same, then progressed to 1961. The J/S distance is 900,000 kilometers longer than the J/SSB distance at 1961. If J orbited S we should not see that variance? Here is the spreadsheet with the data. This is the graph showing distance variance. Carsten’s Sim2 program visualizes all this very nicely. Where exactly is “Carl’s Table” that shows the numbers Leif referred to over at WUWT? I guess somewhere on your site…. I am busy redoing some analyses. I am trying to establish which point Jupiter orbits, the answer is critical. If Jupiter orbits the SSB, when the Sun moves it will change the distance to Jupiter. If the orbit is around the Sun nothing should change. I don’t understand the logic here. All the orbits are elliptical and distances change all the time regardless. I tried to address this issue of what Jupiter and the others orbit in my post March 24, 5:29pm, and concluded “Similarly, Jupiter only depends on The Sun, Mercury, Venus, Earth and Mars. The result is that Jupiter orbits the Sun “for all practical purposes”. Observe the “for all practical purposes”, it was intentional because there is a gradual change as you move outwards, Leif has ignored it (but it changes little). For the planets beyond Jupiter, they orbit neither the SSB nor the Sun. As you look at objects orbuting further and further out, the orbit points shift in the direction of the SSB from the Sun. Is not either/or, it is gradual. If you investigate the orbit of an object on the Oort cloud, it will surely have the SSB as orbit point. On the other hand, the Earth is so far inside the solar system that it almost precisely orbits the Sun (it is a very good approximation). A change of distance should change the rotation rate of the Sun. I have all the JPL data, Jupiter to SSB distances and Jupiter to Sun distances. The data looks to show Jupiter orbiting the SSB, but I need some confirmation, this stuff hurts your head. I think my answer above holds, but if you wanted to be 100% sure, I think you need to compute the distances to the SSB from Jupiter and see if it varies according to an ellipse orbit or not. I think the answer is it does not. Why not? The distance between the Sun and the SSB varies at the same time, as my simulators have shown. Thanks for the URL Geoff, I am downloading…. You may have seen on WUWT that I did the change I announced here yesterday. Instead of summing scalar AM values like I did at first, I am now doing vector sums of the individual planet AM values. In short, as the diagrams at Wikipedia show, the angular momentum is fundamentally a vector (an arrow in space with a direction and length), not just a scalar. The point is that the AM vectors of each planet is normal to the orbit plane of that planet. Since the orbit planes are not 100% parallel, the AM vectors are not parallel as well. Summing the scalar values like I did originally is therefore slightly wrong, resulting in the residual I showed with ±0.1% variation. The variation looked a lot like Jupiter or the Sun’s own variation. It was slightly suspicious. Exactly and its that difference that is added to the Jupiter/Sun distance…that is what JPL is telling me, If the Sun dragged Jupiter with it as it moves around the SSB the distance between both bodies would not vary? The figures are hidden behind the Aphelion/Perihelion distances but they are there. I wouldnt be giving up yet, with this different information, did you need to apply that to the 2nd plot in your original post, it doesnt look right? … then it should be said that the first graph shows a false discrepancy due to the vector problem I explained. With the latest results it is constant within the accuracy of the output format (6 significant digits). The second graph is largely correct (except one might want to decompose the vectors in the same direction as the summed vector, but it would not make a huge difference). What isn’t said for that graph is that for each planet, the average angular momentum has been subtracted, so this is only showing the variable part for each planet. If you don’t do that, you cannot really present the variation, you just get 9 horizontal lines. Or did you consider something else? On the second plot it shows Jupiter getting a disturbance from the normal sine wave pattern at 1970 and 2010. I have never seen that before from Jupiter alone. It would normally occur with the help of Neptune & Uranus as per Carl’s graph. Either you have found something new or there is a discrepancy. Just a bit of basic physics. Please forgive me if I pitch this at the wrong level. momentum of the Sun without forces being involved. Thes can be gravitational forces (in the form of tidal forces) ot electromagnetic forces. However, it is essential that forves are involved in the transfer of momentum. If you look a bit up thread you will see a couple of places where potential forces for transferring momentum are mentioned. One is the fact that as an oblate sphere (and the sun is, of only a little) normal Newtonian physics allows momentum transfer from orbit to spin axis precession, and via a couple of General Relativity forces between orbit and spin. I don’t know if the quantities are sufficient, but there are forces. It is the magnitude of the torques that is the problem. The gravitational torques involved are orders of magnitude too small to accomplish the things that you are asking. The difference in the Sun’s equatorial and polar diameters is of the order of 7- 9 km or less. This level of oblatness is far far too small to produce any noticable rotational torques on the Sun. momentum transfer system – it will have to include a new mechanism that is really out of the ordinary. Peaks in the extremely weak tidal forces of Jupiter, Venus and Earth (produced by their periodic alignments) could lead to the breaking of strong magnetic field lines in the convective layer of the Sun, regulating the massive releases of energy that occur during Solar flares. with respect to the stars every 22 years. The problem with this model is that is hard imagine how the the full gravitational force of Jupiter could tugg on the Sun’s rotation axis. The physics dictates that it must be the tidal force (much weaker in strength) that do the tugging. Ian, I think there may be more subtileness that you are imagining. For example, I could envision that the model of force on oblateness in folks mind is that of the earth and moon where the predominant forces act on the solid earth or solid moon, turning the whole mass; yet for the sun I could just as easily see the thin upper layer (where most of the oblateness exits) taking all that force while the vast majority of the sun (the dense spherical part) would have slippage relative to this skin. This slippage of the skin could then let out more or less energy from the depths and / or it could modulate the conveyor system. You don’t need enough force to move the whole sun, only the oblate “cantaloupe skin”. of the solar mass that is in the outer convective zone. which produces the internal motion. Well, we got that 4.x today (just now) with a 4.3 ! I’m still expecting something a bit bigger on the king tide, so make sure your quake kit is up to snuff if you live on a fault line! If you happen to read this, I was wondering if you could tell me the heliocentric longitude position of your Sim1 program. Where would 0 deg be in relation to NSEW? The coordinate system based on ecliptical coordinates, for example measured as ecliptical longitude angle and radius. If I am not mistaken, zero ecliptical longitude angle corresponds to the direction along the red line from left to right across the image. Zero ecliptical longitude indicates the direction to the vernal equinox. We are looking down on either the north or the south pole of the Sun, can’t remember exactly which one. It is easy to get confused due to the different coordinate system definitions being used when drawing. Maybe something is being overlooked. Phase concordances go way up when…. I think a different projection would help the forecasting of events, considering, as in the days of geocentric system. Showing the planets orbits projection on the surface of the earth, so pointing on specific spots on an earth map. Such an idea looks too much astrological, but it would be good to have one for that purpose and see what correlations would be found. 5.7 earthquake in Willow, Alaska on June 22, 2009 (near Anchorage). And a similar one off the San Diego coast. The global map shows activity in the 5.x range around the Ring of Fire. Looks like Tennessee had slightly lower activity than seismically-active Washington. I am fascinated by this thread, having just read it all, and I would like to inject the thought that there are magnetic forces at work, that could help explain, or be coupling the shifts of angular momentum, between the sun and planets as well as shifting the SSB along with the other local stars, in the swirl of this arm of the galaxy, as it revolves. During discharge phases from summer solstice through fall in general, tropical storms manifest as large scale discharge patterns to ring the moisture, heat, and excess ions out of the tropical air masses. Outer planets conjunctions at these times help to build moisture reserves in the atmosphere, during their ion charge contribution, and enhance storms to category 4 and 5 levels when in phase with their discharge phase influences. So to say that the planets have no real influence on the world in general, is the same as to totally disregard how much the weather, effects how people live and survive. The Earth is having a heliocentric (Synodic) conjunction with Jupiter on the 14th of August, 2009, and on the 17th of August with Neptune. There will be an additional amount of ion flow in the solar wind, from the sun to these planets, that the Earth will be passing through. The result will the Earth’s homopolar fields will increase, along with a detectable shortening of the LOD for a two week period centered, on the center of mass balance between the two gas planets. an electric grid overload when it tries to conduct through the common ground buss. The other effect that will be very noticeable will be a strong increase in (monsoon flow) tropical moisture, coming into the mid latitudes from the ITCZ starting about the 28th of July, 2009, carrying a net positive ionic charge, that will bring in increased hail and tornadoes, August 2nd through the 6th, and a greater batch the 13th through the 18th of August. Globally you should see a big increase in tropical storm activity due to the increasing amount, of energy available, peaking the same period with intensification into hurricane strength, as the discharge phase of cycle starts on the 15th or 16th of August 2009, with the possible power grid outage. Strong out break of hail and tornadoes from 24th of August till September 2nd, 2009. I expect a strong landfall in central Florida, (about the same track as Andrew had), about the 1st of September. The Synod conjunction with Uranus 17th of September, 2009, will be the peak of a smaller charge cycle, giving rise to more global tropical storm production as it passes into the discharge phase, post conjunction. Most noticeable from September 17th through the 30th, of September. The inductive charge gradient appears at the same time as the declinational angle culminates, and due to the pendulum movement effects, hangs at about the same angle for almost three days, before the two bodies sweep through the rapid movement phase, of close to 7 to 10 degrees per day across the equator (for the Moon), the ecliptic plane (for both). There by producing surges in the meridial flow, via declinational tidal bulges in the atmosphere, in phase with the Lunar movement, and the creation and maintenance of a ionic charge gradient across the frontal boundary in addition to the thermal contrast, as well as the moisture content (dew point), for the three days at maximum declinational culmination. Enhancing the precipitation rates, maximizing and sustaining the ionic charge gradient. Negative charges are free to travel as liberated electrons, that fan out ahead of the moving cold front, as the normal production of Sirius clouds. Positive ionic charges on the other hand, have to move whole molecules, to travel, so are trapped mostly in the surface layers with high moisture content, that form the updrafts into the lightning producing clouds. As the ions from both sources rush toward each other, (typical convergence speeds in a thunderstorm are in excess of 50 to 70 MPH) all moisture with ionic charges on it combine to form neutral precipitation, all condensation nuclei, become trapped in the droplets, the moisture attracted to each other falls when massive, and the dust free cold air exits the clouds as down bursts, invisible outflows. The visible clouds them selves, are constantly being reinforced with fresh ionized air mass, so the charge process due to non visible turnover, (both air masses entering in excess of 45 miles an hour, while the front is only moving slowly, or not at all some times.) is many times the volume it appears to be as seen from the ground. Powering the rapid condensation, and the left over ionic charges are discharged as lightning. (Grapnel processes still apply to intra cloud transfer of charges) Most of the power is in the invisible incoming air flow, and the large volume of processed deionized air is also not visible as it exits the thunder cloud, which is what makes it dangerous for aircraft. The tidal bulge dynamics can be used to judge the inertia of the frontal system to plot it’s movement. And the inertia of the center of the air mass is a better indicator of the potential movement of a storm than the resultant frontal boundary or the low pressure generated along it. Basically, I wanted to ask if you have considered the flow of plasma ion (solar wind) energy between the sun and the planets, as having a magnetic inductive effect, although weak, that could play an important part of the transfer of angular momentum, shifting the LOD on the planets, as an additional input for earthquake triggering. The increased coupling at the time of Synod conjunctions, causes a rapid spin up, then deceleration in passing. I have in the past plotted earthquake production,(as a total of Quake magnitude) verses the cycle time of J E, SE, ME, and EV synod periods and found that there was a good correlation to increased total quake energy released, the three weeks prior and post conjunction in all cases. I still have not compiled a graphic history of quake production, using the analog periods I use for weather forecasting. But by plotting long and lat of quake production on the surface of the Earth with respect to the simultaneous Lunar long and Lat with respect to the center of the Earth (the spot on the surface directly above the barycenter) where the Earth tide is centered, shows a nice trend. I would think the effect of the declinational movement of this tidal bulge, would open cracks in faults lines or at least lower compressive stress, enough to help trigger quakes. And at spreading ocean ridges, act similar to a healing cut on the top of your knuckle, every time after a scab forms, you bend your finger it cracks open enough to let fluid seep out and form more scab, till the increased compressive forces limit the full straight extension of your finger. Or in sea floor movement terms, as the roving declinational bulge moves North and South it separates the ridge enough to let out some fresh magma that then cools, and acts as a small set acclimating wedges, that help to pry the ridge apart. The other thing I found was the direction of the fault line (the East West ones) slip when the moon is over head, and the North South ones, on the relative Latitude position the moon is overhead of. Most of this stuff and plots are stuck on an old Mac running os7.5, along with 3D xyz plots of tornado production by N/S lunar declination by years, X Julian date, Y lunar declination, z number of tornadoes reported per day. Comparisons of number of tornadoes by Julian date in 2D, x is Julian date, Y number of tornadoes per day, and a comparison graph with the same data ( tornadoes from 1950 thru 1995) 3D with Y axis the Lunar declination and Z axis a bubble graph showing the number produced. The 3D graph shows a much better picture of the dynamics involved, and by plotting the lunar declination for each day in the target year of forecast predicts probable tornado production, when the new curve passes thru the concentrations of the past production. I have done the same type of plotting for forecasting the Morning Glory waves in Australia with good results. well was good babbling at ya, will wait to hear the other side of the conversation…. It will take me a while to work through your comments. FWIW one of my “surmises” is that the reason we have an “ozone hole” at the south pole and high ozone levels at the north pole is Birkland currents. There are two “spots” of higher ozone level at the N. Pole exactly as though a large plasma conduit from the sun terminates there. (And asymetrical with the S. Pole exactly as one would expect with a magnetic impact on said current). So there is much to recommend the “Electric Earth” model. There is just so much to absorbe that it will take me a while to catch up. He has produced a graph of the SSB-solar equatorial distance in the z axis against changes in length of day and global temperature. Asking questions, and finding answers to compare, to further evaluate, gives us a gathering of knowledge, to evaluate the hypothesis skeptically, while figuring out better questions, to ask for the next set of trials. Diversity of thought in additional areas of knowledge, gives a more rounded vision, allowing the formation of more complex answers, and resultant questions, that can present data in a format, that is visual enough that it shows the balancing of several forces at work as they really do. From a viewpoint of how the assemblage of parts seamlessly fits together, you only have to do is watch the (short but seemingly) endless stream of satellite photos animated and synchronized by 27′.32 days periods, to see the repeating cycles. To set up five tiled windows, in the first show day one- thru27 sequentially, the as they continue on in the same stream, the cycle of the first 27 days continues anew in window #2, synchronized by Lunar declination to #1. 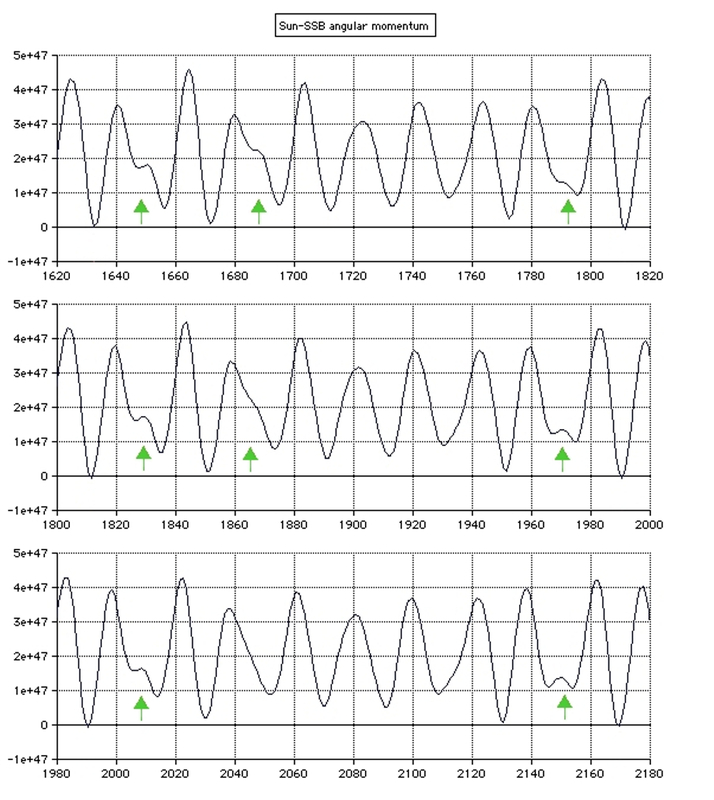 Till they spill over into window #3 stepping in phase with the other two, #4 the same idea gives you the four basic patterns of the Rossby wave 109.3 day cycle, of global circulation, that then repeat but seasonally shifted. In window #5 then would be the first repeat of window #1 in the same phase of the same pattern, and should look a lot like window #1. As the progression through the total series , proceeds, 6558 days into the five stacks a 6th window opens and the original day #1 in window #1 opens as #1 in window #6. As the series progresses on, real data can be viewed, in the real interactions going on. This would give you a look into the cyclic pattern that develops from the repetitive interaction of the inner planets and Lunar declination, phase, perigee/ apogee cycles. By adding a sliding ball, vertically moving up and down a +-30 degree scale bar, on the side of each tile space, that shows the plot of the current Lunar declination for the time of each frame. By adding another slide bar of +-30 degrees at the top, of each tile you could view each outer planet as we pass them, as color coded discs labeled, J, S,U, N, shifting from left to right as we pass them. this progression of the outer planets can then be seen in the additional surges in ion flux as they go by. Once the amount of additional angular momentum, and the process of it’s coming and goings clearly seen, it can then be measured, it’s effects calculated, and incorporated into the climate models, giving us a much better picture, of all of the parts of the puzzle. All of the necessary data is in the archives, and free to use to those that have the where with all, to assemble the real truth, be it inconvenient or not. For application in Quake sightings, and subsequent formulating hypothesis and developing forecast parameters, you could substitute, or add (if your video resolutions is good enough), intensity quantified dots on the surface of occurring quakes (play with fade out time to see time shifts etc.) and an open circle showing the moving location of the earth/moon center line.